A side-by-side refrigerator is a special form of refrigerator and freezer combination. It is characteristic that the arrangement of the doors is designed from hinged doors. As a rule, the refrigerator and freezer rooms are located next to each other behind the doors. The cooling section is considerably larger and is located on the right-hand side of most units. The side-by-side refrigerators are also known as American refrigerators and have a capacity of more than 500 litres. This is due to the fact that households in the United States are more inclined to make bulk purchases and therefore require more refrigerator and freezer space. These large refrigerators can easily supply five to eight people. A further distinguishing feature is that the storage areas in the hinged doors are sufficiently dimensioned. Not only drinks can be stored here, but also many other refrigerated foods. These huge refrigerator-freezer combinations can also prepare ice . A ice and water dispenser is integrated in the outside of a hinged door. So we can get ice cubes, crushed ice and cold water at the push of a button. However, the models with ice cube makers require a solid water connection. In this respect, the installation effort is considerably higher, similar to the connection of a dishwasher. The first devices were still true power guzzlers. 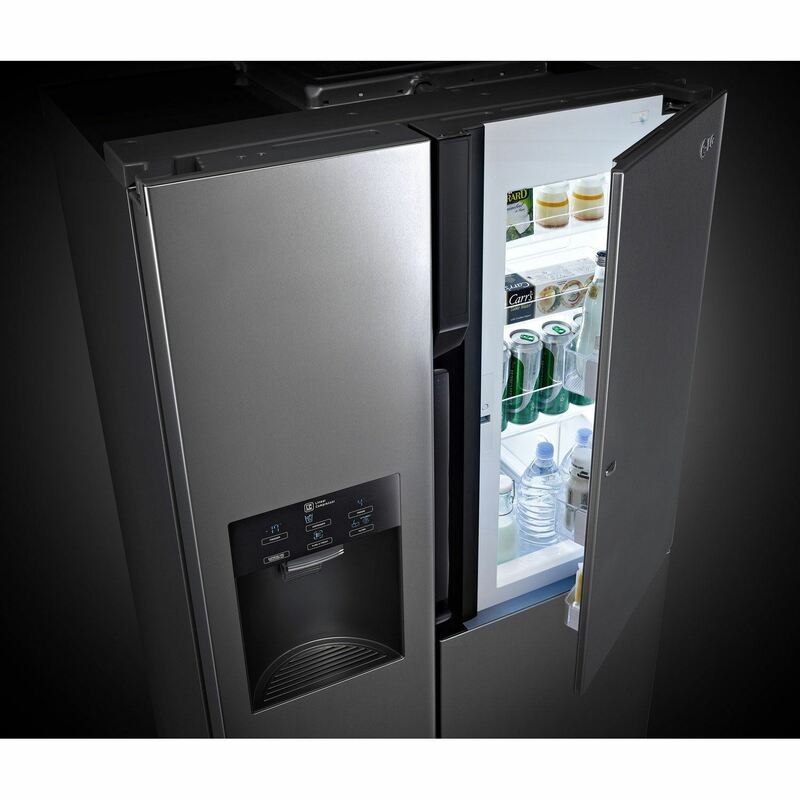 However, the modern side-by-side refrigerators now achieve an energy efficiency class of A++. However, there are still models with a high current consumption that only correspond to efficiency class A+. You should pay attention to this when buying. American refrigerators are sometimes enormous in size. They can be a good 92 x 72 x 180 cm (W x D x H). This allows you to exceed the usual standard dimensions of kitchen appliances of 60 cm by far. If you are interested in a side-by-side refrigerator, you should also have the necessary space at your home. Especially in fitted kitchens problems can occur. Unfortunately, most side-by-side refrigerators cannot be installed in a fitted kitchen unit . The cabinets are simply too narrow for this. So it is not surprising that most devices are offered as single stand models. Visually, these refrigerators are characterized by a stylish design. They are usually provided with stainless steel fronts, whereby brushed or matt surfaces in particular provide a great eye-catcher. After all, a side-by-side refrigerator is a great eye-catcher that your guests will envy. How does a side-by-side refrigerator work? A side-by-side refrigerator works like a conventional fridge-freezer combination. Basically, this is a compressor refrigerator. In these models, a gaseous refrigerant enters a compressor and is compressed there. This causes the refrigerant to heat up. With the help of the so-called condenser, which consists of black cooling coils and is attached to the back of the refrigerator, this heat is released into the environment. The refrigerant condenses in the coils and is conducted via a capillary tube to an evaporator inside the refrigerator. The evaporating refrigerant takes the heat from the refrigeration compartments and transfers it to the external compressor. The mode of operation is comparable to a heat pump. This process uses thermostats to achieve the desired cooling temperature in the refrigerator. Different cooling circuits in a fridge-freezer combination ensure that two different cooling zones are created here. Modern appliances also offer additional cooling areas, which we can adjust individually via a control panel. In our Side-by-Side Refrigerator Test we would like to briefly explain the advantages of such a fridge-freezer combination. Many households usually have a normal refrigerator for food in their kitchen. In fitted kitchens, compact refrigerator and freezer combinations are sometimes used. Frequently, a refrigerator or even a freezer is operated again in the storage cellar. In particular for larger families it plays an important role for cost reasons to be able to store as many stocks as possible refrigerated. In the meantime, many are outsourcing their fridge-freezer combination from a fitted kitchen and ordering a large fridge instead. Those who have enough space should consider whether a side-by-side refrigerator would not be the right choice in this case. Instead of several smaller refrigerators, some of which are installed at different locations in the household, a side-by-side refrigerator requires only one appliance. A side-by-side refrigerator offers sufficient storage space for frozen and chilled food . The advantage is that you have all the food stored in stock in one place at your fingertips. You no longer have to travel long distances, for example to the cellar, to get some frozen food out of the freezer. If you have the possibility, you can also choose a side-by-side refrigerator with a built-in ice cube maker . However, this only makes sense if a fixed water connection to the refrigerator can be laid. What types of side-by-side refrigerators are there? Before you decide to buy one of our Side-by-Side refrigerators Comparative test winner, we would like to introduce the different types in more detail. In the meantime, side-by-side refrigerators have become real design pieces. With a brushed stainless steel finish or white paint finish and an attractive housing design, these large fridge-freezer combinations are a great eye-catcher in any kitchen. These standing refrigerators can be placed independently of any fitted kitchen . With their diverse fronts and coatings, they form a unique selling point. These refrigerators are even available with integrated glass fronts. The freestanding side-by-side refrigerators not only offer plenty of space, but also plenty of space on the outside for magnetic stickers, recipes and other leaflets. It is not always necessary to have an integrated ice cube maker. The built-in refrigerators that can be seamlessly integrated into an existing fitted kitchen are very popular. In the first fitted kitchens, only smaller fridge-freezer combinations could be installed. Today we also find side-by-side refrigerators as built-in refrigerators for a kitchenette. However, these devices are rather the exception. It often gets difficult with the optics, because these refrigerators have huge doors and sometimes also an ice cube maker. Here we can't just screw an existing kitchen front in front of it. If you are interested in a side-by-side refrigerator for installation, you should definitely hire a specialist company. As a rule, our own designs do not lead to the desired success. more expensive due to additional installation. In our Side-by-Side Refrigerator Test 2019 we have highlighted some test criteria to make it easier for you to choose a suitable refrigerator. It is particularly important for an American refrigerator that the refrigerator and freezer parts are separated from each other. In contrast to our conventional fridge-freezer combinations, where the freezer compartment is at the bottom and the refrigeration area at the top, in a side-by-side refrigerator both areas are next to each other. Both cooling areas are each closed by a hinged door. This also ensures that by opening the correct side of the door, only the refrigeration or freezing area really needed is opened. In this way, no cold can escape unintentionally. In our test almost all side-by-side refrigerators are constructed in this form. Some high-quality side-by-side refrigerators are equipped with a square flap on one half of the door. Behind is a small bar compartment . With the help of this so-called Door-in-Door-Principle we can store cool drinks. The advantage is that we have quick and easy access to this bar compartment and do not have to open the entire refrigerator first. Otherwise precious cold would be lost again. Such a separate bar compartment also saves an enormous amount of power. Not every side-by-side refrigerator is equipped with this feature. In addition to a bar compartment, many side-by-side refrigerators are also equipped with a ice cube maker, an ice crusher or just a cold water maker. Such a device is particularly suitable on hot days or for family celebrations. If you are going to short-list such a side-by-side refrigerator, you should keep in mind that these appliances must also have their own fresh water connection. A crucial point in our side-by-side refrigerator test is energy consumption. Since 2019, for example, electrical appliances offered on the Internet must also be labelled with the energy label. We have made sure that our Side-by-Side refrigerator comparison winners are definitely in the best A-range. Class A+++ has the lowest energy consumption and is therefore very economical. We have found that even functional, old refrigerators should be replaced, as their electricity consumption over time does not pay off. Even if, for example, a new side-by-side refrigerator is more expensive, the electricity costs will amortize enormously over the next few years. What to look out for when buying a side-by-side fridge? Choosing a side-by-side refrigerator is not easy. Think carefully about the size and features of such a device beforehand. Below we have listed some purchase criteria that can be very useful for a side-by-side refrigerator. Most modern side-by-side refrigerators are equipped with a so-called NoFrost technology. This means that you no longer have to defrost such a refrigerator. The NoFrost technique is a circulating air system in which the humidity is extracted from the air inside the freezer. The moisture is gradually released into the outside air. In the following we will explain how this technique works. Many side-by-side refrigerators are labeled Super-Frost or Super-Cooling. We can quickly bring the current temperature into the minus range at the touch of a button. This function is quite practical, regardless of whether you want to freeze food very quickly or cool food in the refrigerator faster. During quick freezing food is frozen in a much more vitamin-friendly way , since the required freezing temperature is reached much faster. In addition, with such a function we can also avoid the dreaded freezer burn. When food is rapidly cooled down in the refrigeration area, the drop in temperature ensures that perishable food stays fresh longer . As we have already explained above, side-by-side refrigerators require an enormous footprint. This must also be present in the kitchen area. If necessary, you have to change your plans and create a free wall. However, please note that not only a power connection must be established, but also an additional water connection. A side-by-side refrigerator is ideally located where the dishwasher and the sink itself are located in the immediate vicinity. Many side-by-side refrigerators differ in terms of child safety. While some models are designed in such a way that the handles are relatively easy to open even for smaller flatmates, other devices offer an explicit child safety feature. Here you should inform yourself about the respective model exactly for which target group it is best suited. What is the correct design? Refrigerator-freezer combinations are offered in various designs. In the case of a free-standing refrigerator, we speak of a stand-alone appliance. On the smaller models there is a corresponding cover plate above. If we can remove this cover plate, it is a underframe unit. We can then slide this under a worktop. A built-in appliance is a refrigerator that is supplied without side panels and is only suitable for installation in a kitchen unit. These models can be easily adapted to the decor of the kitchen with a matching door trim. Side-by-side refrigerators, which we will cover here in our test, are purely stand-alone appliances. They also do not have a removable worktop, as the height of around 180 cm means that they can only be set up separately in the room. In this respect, when ordering a side-by-side refrigerator, only the stand-alone units are considered for you. The size of a refrigerator depends primarily on the number of persons in the household. It also depends on how often you use such a device. As we have already informed you, side-by-side refrigerators have a volume of at least 500 litres. As a guide, you can assume a volume of 100 litres for a single household . Two people manage with about 120 to 140 litres. For each additional person we should plan about 50 to 60 litres. A side-by-side refrigerator can therefore easily serve an extended family of 6 to 10 people. Whether you really need that many litres depends, among other things, on whether you frequently eat at home and prepare the dishes yourself or whether you prefer to eat out or in the canteen. If you want all the ingredients to hand quickly, a large refrigerator can be worthwhile. When selecting a side-by-side refrigerator, it is important that you find out in advance about the best-known and leading manufacturers of side-by-side refrigerators. The following selection is only an example and cannot be conclusive due to the large number of manufacturers. The South Korean Samsung Group based in Seoul was founded in 1938. This group manufactures household appliances and multimedia products. With its televisions and smartphones, the company has become internationally renowned. The product range also includes large household appliances, such as fridge-freezer combinations. Samsung Side-by-Side refrigerators are not only characterized by a stylish design, but also convince with a high variety of functions. Most models are presented in an attractive stainless steel front. Of course, an ice crusher should not be missing here. But there are also models without ice cube makers. The control elements with LED display are also integrated in the hinged doors. In this way the operation is relatively simple. These elegant American refrigerators have a high storage volume of more than 500 litres. The defrosting system is formed by a modern NoFrost function. These devices are also state of the art and have an energy efficiency of more than A++. Overall, the elegant side-by-side refrigerators are in the upper price segment. Ultimately, what matters here is the scope of the equipment. LG Electronics Inc. based in Seoul is another South Korean group specializing in multimedia products and household goods. The product range also includes side-by-side refrigerators. 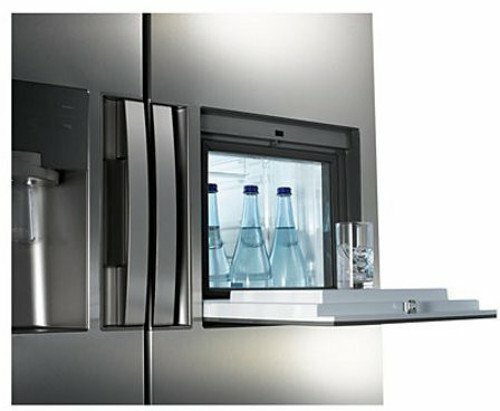 LG side-by-side refrigerators look very similar to Samsung models. There are models with and without Ice-Crusher. As with almost all models with an ice cube maker in the side door, these machines require a separate water connection. A special highlight are the integrated bar compartments, which open at the touch of a button. Cool drinks can be stored there. The removal from this bar compartment ensures that no unnecessary cold air can escape from the rest of the cold store. LG side-by-side refrigerators also offer the very latest technology inside. The Moist-Balanced Crisper cover keeps food and especially fruit fresh for longer. A no-frost function is also a must in this price range. 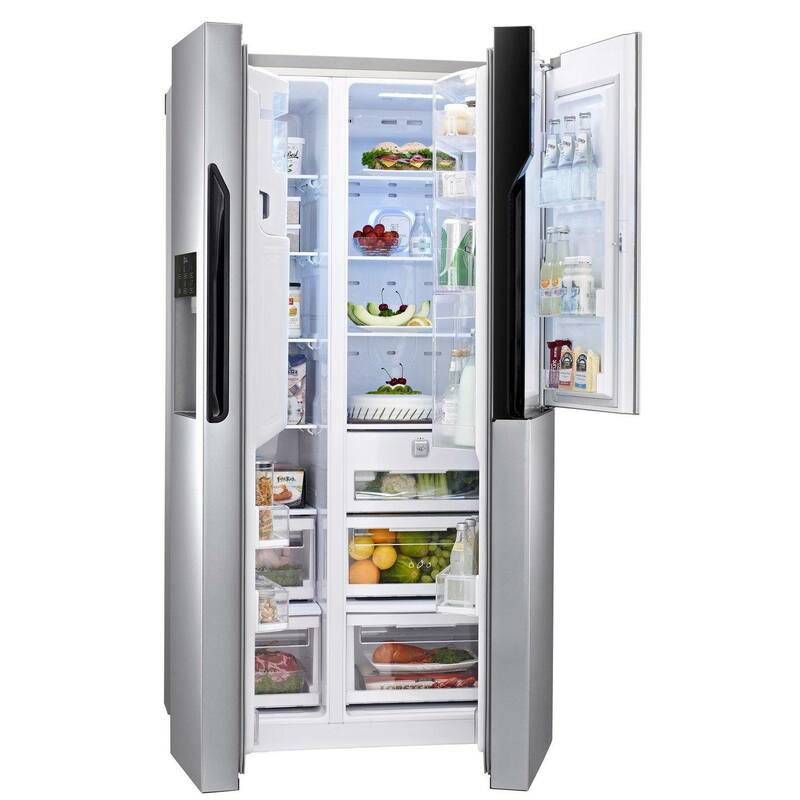 In general, the innovative LG side-by-side refrigerators are in the upper price segment. The original Beko Elektronik A.S. is now called Grundig Elektronik A.S.. The company, which belongs to the Turkish Arcelik Group, specialises in large electrical appliances. Even today, for example, refrigerator-freezer combinations are still offered under the Beko name. Beko side-by-side refrigerators are characterized by a modern design . They are not quite as high quality as the refrigerators of the two aforementioned suppliers. Nevertheless, we also find here various stainless steel fronts and models which contain only a water dispenser instead of an ice cube maker. The side-by-side refrigerators located in the medium to upper price segment have the proven NoFrost function, several cold zones and high energy efficiency. These appliances are an interesting alternative to the other side-by-side refrigerators. The Slovenian manufacturer Gorenje d.d. based in Velenje is known for its innovative household appliances. The company was founded in 1950 and sells its products as an original equipment manufacturer, but also under a different name. Gorenje Side-by-Side refrigerators are available in many attractive housing colours and are made of high-quality stainless steel. Especially interesting are the models with integrated ice cube maker and own bar compartment. A quick-freeze function, NoFrost technology and LED lighting round off the complete package. Gorenje side-by-side refrigerators lay in the middle price segment. With their good features and stylish design, you can easily keep up with the more expensive models from Samsung and LG. Only the energy efficiency is not too high here. The German Robert Bosch GmbH with headquarters in Gerlingen was founded in 1886. 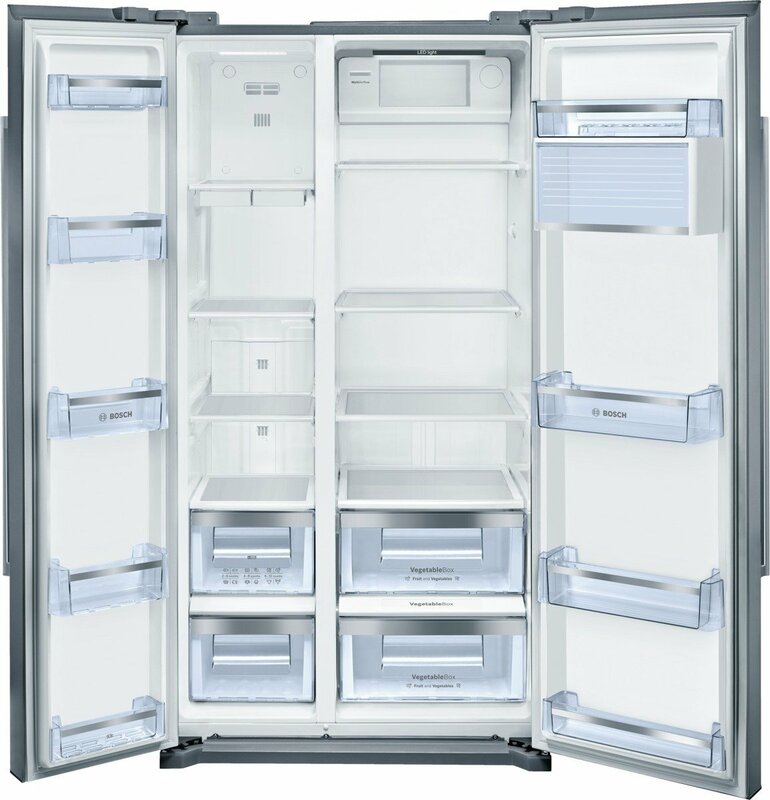 In addition to tools and other household appliances, Bosch also offers high-quality fridge-freezer combinations. The reliable Bosch side-by-side refrigerators , some of which have their own bar compartment and ice cube maker, are quite popular. Depending on the model, a separate water connection must be available. These side-by-side refrigerators impress with an attractive stainless steel front and two large-dimensioned hinged doors. Here you can store a lot of food. Again, super-freezing, NoFrost, various freshness zones and LED lighting are available. The refrigerator and freezer room have separate temperature controls. Overall, the Bosch side-by-side refrigerators are in the middle to upper price segment. The Panasonic Corporation, headquartered in Kadoma near Osaka, is one of the large Japanese electronics groups. The company is known for its multimedia products as well as for its innovative household appliances. Panasonic side-by-side refrigerators are characterised by a high quality of workmanship and a stylish design. These models with stainless steel fronts usually also offer an ice cube maker. With an average energy consumption of 345 kWh, these appliances are in the good middle range. Panasonic side-by-side refrigerators are operated via a modern touchscreen panel. The top models are not only equipped with different cooling and freezing zones, but also with the so-called Hygiene Active System, which destroys almost 100% of all harmful bacteria. These innovative cooling units correspond to the current state of the art. In terms of price, however, these household appliances are in the higher price segment. On average, you must expect 2,000 euros or more here. Internet vs. specialist shops: where is the best place to buy my side-by-side refrigerator? If you have decided to buy a new side-by-side refrigerator, you would also like to know where you can best buy such a device. Various solutions are available for this purpose. On the one hand, the relevant electronics stores, kitchen stores and larger department stores offer these refrigerators, but on the other hand you can also order such a device via the Internet. Most shops can only be reached by car once you have arrived. In addition to an awkward search for a parking space, these shops are very crowded, especially on weekends. Unfortunately, there is no question of a relaxed selection then. On site you will notice that the model which you have shortlisted does not exist . The sellers will try to sell you another refrigerator instead. Frequently, such a refrigerator not only does not meet their expectations, but is also offered at a higher price. However, if you choose a fridge-freezer combination, you may not be completely satisfied with the appliance at home. Unfortunately a return is particularly difficult. There are many merchants who are reluctant to take back their goods. Instead of a purchase price refund you have to make do with a goods voucher . You can avoid this stress. You can sometimes take such a device with you immediately. if you don't like it the return can be quite exhausting. Very popular is an order via the Internet. The relevant online shops offer you the largest selection. Here you will certainly find one of our comparative test winners. Due to the hard price war among the various online merchants, you can usually also profit from very low prices . The ordering procedure is extremely simple. We are pleased that you can order around the clock on the Internet. Weekends and holidays don't matter. In the meantime, the payment procedure has also become very secure. First and foremost, contact certified dealers. For larger purchases, delivery is often free of shipping costs. If you wish, you can have your side-by-side refrigerator delivered within 24 hours . Another good solution is that you have a right of withdrawal. If you do not like the side-by-side refrigerator, you can have it picked up again by the forwarding agent and get your purchase price refunded by the dealer. if you do not like the product you can exercise your right of withdrawal. You cannot see the device in the shop in advance. If we consider the advantages and disadvantages, we can only advise you to order your Side-by-Side refrigerator via the Internet. Side-by-side refrigerators represent a significant investment. These spacious refrigerators should be bought carefully. To provide you with further useful information, we have compiled the following points for you in our guidebook. It has been known since ancient times that food was cooled with block ice in so-called ice cellars. This was transported inconveniently from the mountains. The first artificial cooling was introduced in 1748 by William Cullen at the University of Glasgow. an air compression. In 1859 Ferdinand Carré further developed the cooling system. He used ammonia as a coolant for the first time. At that time, however, until 1950 there were mainly wooden refrigerators in the households, which were lined from the inside with zinc sheet metal. This contained crushed ice from factories or ponds, which was stored under sawdust to preserve it for a longer period of time and was put into the refrigerator when needed. The German Carl von Linde further developed the refrigerator in 1876. He improved the compressor technology and finally made the refrigerator ready for the market. In the USA and on Cuba refrigerators belonged to the standard equipment of every 2nd household. In 1929, Jörgen Skafte Rasmussen designed the first European refrigerator at the J. S. Rasmussen engine works in Zschopau. These devices were operated with ammonia as well as with sulphur dioxide and methyl chloride. However, the gases escaping in the event of leakage were toxic. This problem could only be solved with the use of chlorofluorocarbons. In the meantime its ozone-depleting effect is known, so that from 1992 onwards only CFC-free refrigerators and freezers are manufactured. The first model was developed at the Institute of Hygiene in Dortmund at the suggestion of Greepeace under the direction of Harry Rosin. The disadvantage is that this so-called Dortmund mixture of propane and butane is combustible. However, the new coolant is in a closed circuit, so that the risk is largely reduced. Since 1950, refrigerators and freezers have undergone continuous development. Particularly in terms of energy-saving operation, the modern devices achieve values that correspond to the energy efficiency of A++ and more. With the following facts and figures, we would like to provide you with even more useful information so that you can familiarise yourself in more detail with the topic of a side-by-side refrigerator. Modern fridge-freezer combinations and side-by-side refrigerators are equipped with a NoFrost function . A fan blows cold air from the cooling fins into the freezer room, which is distributed over all compartments. In this way the stored food freezes. This circulating air cooling system absorbs the humid air created by the penetration of warm air. For example, when we open the freezer door, warm air enters the interior. Heat can also penetrate through poor seals. compartments, which unnecessarily increases the power consumption of a freezer. The warm and humid air now returns to the cooling fins via the fan. The NoFrost technology allows the cooling fins to be heated regularly, whereby excess ice defrosts on its own and enters an evaporation container. Even if devices with the NoFrost function have a slightly higher power consumption, the purchase is worthwhile, since manual defrosting, in which the freezer must be completely brought back to minus temperatures, is omitted. We save energy sustainably over a longer period of time and in this way also conserve our freezer. Even modern side-by-side refrigerators today have a NoFrost function, so that we do not have to defrost the freezer part in an awkward way. Statistics have shown, for example, that a 10-year-old refrigerator with 600 kWh annual electricity output causes electricity costs of around 170 euros. In energy efficiency class A+, a comparable device achieves an annual power output of 445 kWh. Only about 125 Euro electricity costs per year will be due. For a device with the energy efficiency class A++, the annual electricity costs drop to 105 Euro. However, this only becomes clear in the A+++ class, where we only have 71 euros in electricity costs per year for a comparable refrigerator. In our side-by-side refrigerator test 2019 we would also like to explain to you how you can properly place such a refrigerator. Although there are many compartments and boxes, especially in the refrigerated area, we should not simply store our purchased food at random. In a refrigerator there are different climate zones. As is well known, the heat rises from bottom to top, so that the coolest compartments are at the bottom. It is therefore particularly important to know which foods belong in these different zones. This is one of the main reasons for the shelf life and freshness of food. In addition, side-by-side refrigerators have various vegetable compartments. Here we also speak of the 8 to 12 degrees zone. The vegetable compartments are far below and have a relatively high humidity. These compartments or boxes are ideal for storing vegetables and fruit. This keeps these foods fresh and crunchy for a particularly long time. Finally we have the cupboard door of our side-by-side refrigerator. This door half of the cooling area is equipped with different compartments, which of course are also affected by the different cold zones. Again it is said that the upper compartments are warmer than the lower ones. Let us now turn to the freezer compartment. This is also locked by a hinged door. Modern side-by-side refrigerators can also have different freezing zones here. However, these temperatures are always far below freezing . of course all purchased frozen packs. It is quite advantageous if a side-by-side refrigerator has a special air cleaning system inside the cooling area. In LG, for example, this is called Pure N Fresh. This absorbs unpleasant odours and fresh air is directed into the cooling area. This can be particularly advantageous for cheese and other odour-intensive foods. In addition, many modern devices also have special Fresh compartments, which are designed for the storage of fruit and vegetables. Depending on the manufacturer, these compartments are also provided with a ribbed surface. For LG, this is referred to as Moist Balance Crisper. This corrugated surface collects the moisture, which is then gently released back into the food. This keeps fruit and vegetables fresh and long-lasting even longer. Even though the models with integrated bar compartment, water and ice cube dispenser and touch screen display already belong to the absolute luxury class, there are still more surprises. Some side-by-side refrigerators can even be operated via a smartphone or tablet . In combination with a corresponding app, the different temperature zones of such refrigerators can be set particularly easily. To enable communication with other multimedia devices, these high-tech refrigerators even have Wlan connectivity. You can even send cooling commands to your side-by-side refrigerator via the in-house Wlan router when you are on the move. The step of such refrigerators having their own stock management goes even further. As soon as the most important foods in such a refrigerator run out, you will be informed about it on a smartphone or tablet. Then you must either replenish the food yourself or leave the food order to your refrigerator. In the meantime, Side-by-Side innovations have been presented at the trade fairs, which are even equipped with a 21.5-inch Full HD touch display. Using this type of Tablet PC, you can manage your own shopping lists directly in the fridge, search for recipes from the Internet, organise family calendars and, if desired, display photographs. These new side-by-side refrigerators even have several digital cameras inside that regularly photograph the interior and the stock of food. The result will be sent to your Smarphone. In this way you can check what you need and buy it at any time during the purchase. These new High Tech refrigerators with Smart-Home function are still unique pieces, but should soon move into the domestic kitchens. 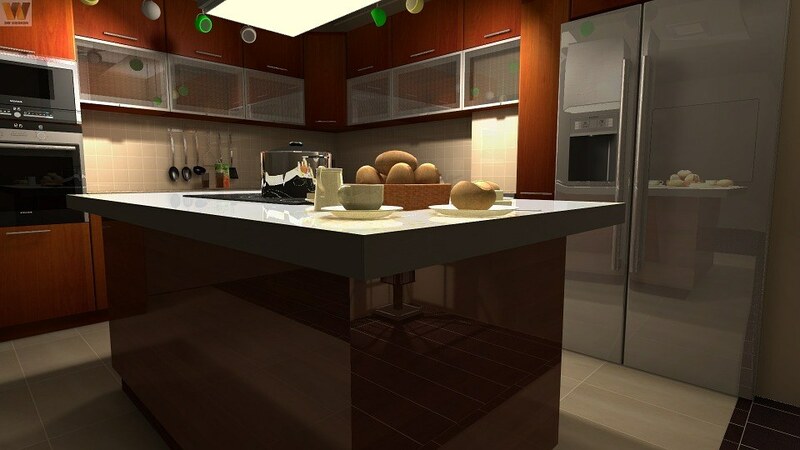 We are curious to see whether this technology will prove its worth in everyday kitchen use. Even if modern refrigerators are equipped with a so-called NoFrost function and make conventional defrosting superfluous, we would still like to briefly explain to you in our test how to defrost your refrigerator correctly. The best time to defrost is the cooler and colder season. This makes it much easier to remove chilled food from storage. The winter season with frost is of course particularly advantageous for temporarily storing frozen food on the balcony, for example. Otherwise, however, a cool box with freezer packs can also hold a limited quantity well. In principle, regular defrosting is important in order to reduce the energy consumption of a refrigerator-freezer combination. If, for example, the freezer compartment is very icy, a thick layer of ice automatically forms. In this case, the refrigerator has to produce significantly more energy in order to reach its full cooling or freezing capacity. The thick ice sheet acts as an additional insulation. For cooling/freezing combinations without NoFrost function, we should defrost them at least twice a year. First switch off the refrigerator and remove the food stored there. If the refrigerator is left on, the sudden heat can damage or overload the thermostat of the refrigerator. The easiest way is to leave the fridge door open. This ensures that at least the freezer compartment is defrosted very gently. But it also goes a little faster. When the door is open, you can blow warm air into the interior with a hair dryer, for example. It is particularly effective if you place a cooking pot with hot water in the freezer compartment and then close the door. The formation of condensation water is problematic. If there is only a thin layer of ice, it is sufficient to place dish towels or terry towels in front of the doors of the refrigerator. These are absorbent and safely absorb the condensation that forms. If a lot of water flows out of the refrigerator due to a thick layer of ice, then you should put a baking tray or other deep container under the door. Under no circumstances should we scratch ice residue from the freezer compartment with a sharp object, as this could damage the refrigerator. Care must be taken with the cooling coils, which may lie in this icy area. Here we are only allowed to remove the ice carefully with a plastic or wooden scraper. Even a small hairline crack in the cooling coils would lead to the defect of the refrigerator. After the ice is removed, it goes to a fathomable cleaning. A conventional detergent is perfectly sufficient for this purpose. If you are not afraid of the smell, you can also use warm water with vinegar. Such a mixture not only cleans, but also disinfects the surfaces. To avoid freezing of the freezer compartment, there is an old trick. We coat the surfaces lightly with olive oil. This prevents the ice from settling so quickly on the sides. If you are interested in a new side-by-side refrigerator, you are sure to come up with a few more questions. Here we would like to give you a selection of FAQs that can help you choose the right side-by-side refrigerator. How to connect a side-by-side refrigerator? A side-by-side refrigerator is first connected to a free mains socket like a conventional fridge-freezer combination. Despite its impressive size, it does not have to be operated via a power line, such as the electric cooker. 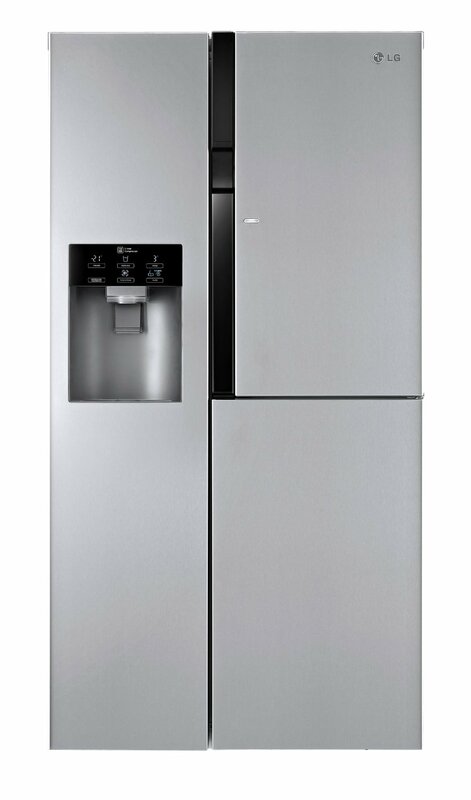 Interesting are the side-by-side refrigerators with ice cube maker or cold water dispenser. These refrigerators need in any case an additional water connection, as also with the dishwasher usual. However, a much thinner inlet hose is required for the connection. Make sure that the hose is long enough to be laid from the water connection to the location of the side-by-side refrigerator. If you have already connected a dishwasher to the water supply, you can also connect the refrigerator with its hose there via a Y distributor. It is important that a water filter is also used at the connection for the side-by-side refrigerator . If necessary, you can also disconnect the inlet hose and attach the water filter in between. On the other hand, many manufacturers already offer ready-made solutions with integrated filters. The water hose should be laid in such a way that it cannot be damaged while the kitchen is running. Some also lay the hose directly on the wall. It is ideal if this disappears almost invisibly behind the kitchen unit. How much power does a side-by-side refrigerator consume? The average consumption of an adult side-by-side refrigerator is between 250 and 450 kWh per year . The decisive factor is always the respective energy efficiency class. Assuming a kilowatt hour price of 28 cents, an annual consumption of 250 kWh would come to 70 euros. Most manufacturers inform you of the corresponding consumption values in the operating instructions. However, these are generally determined at an ambient temperature of 14 degrees Celsius and serve only as a rough guide. Often the power consumption is slightly higher than these guide values. With a typical American refrigerator with hinged doors you should at least expect 100 Euro per year. When purchasing, also make sure you have an energy efficiency class of at least A++. Even the devices with class A+ require quite a lot of energy. How loud are side-by-side refrigerators? Nowadays not only the energy consumption plays an important role, but also the volume. Disturbing background noises can be very unpleasant in the long run. Especially if you are in the kitchen for a long time and always have to hear a persistent hum of the compressor of a refrigerator. Unfortunately the volume cannot be tested during the purchase of a side-by-side refrigerator. In addition, people's perception of volume is very different. There won't be completely silent devices. A slight humming is always audible in a side-by-side refrigerator and is completely normal. It is well known that the volume of electrical and household appliances is expressed in decibels A, or dB(A) for short. Volumes between 30 and 40 dB(A) are perceived to be particularly quiet. This is comparable to the ticking of a wall clock. At 40 dB(A), the volume is already perceived as a soft whisper. Based on the numerous manufacturer specifications, side-by-side refrigerators achieve a volume between 39 and 45 dB(A). For our terms, these values can still be perceived as very quiet. How heavy are side-by-side refrigerators? Even if we do not constantly push a bought side-by-side refrigerator around in the apartment, the total weight also plays an important role. Due to its size alone, we can conclude that it is very heavy. A side-by-side refrigerator weighs between 110 and 140 kg when empty. If you decide to use a side-by-side refrigerator of this type, it is advisable to organise transport to your home via a forwarding agent for the purpose of delivery. The advantage is that the forwarding agents not only place the side-by-side refrigerator directly at your new location, but also take the superfluous packaging material with them. With a few euros tip, they may even be able to connect your side-by-side refrigerator to you. What is the layout of side-by-side refrigerators? In contrast to the conventional refrigerator-freezer combinations, in which the freezer compartment is at the bottom and the refrigerator compartment at the top, in a side-by-side refrigerator both areas are located next to each other behind a hinged door. Depending on the size of a side-by-side refrigerator, the maximum useful content plays an important role. For example, an approximately 180 cm high side-by-side refrigerator is divided into a 360 litre refrigerator and a 210 litre freezer. The values vary depending on the model. A similarly sized side-by-side refrigerator can also have a 400-litre refrigerator compartment and a 220-litre freezer compartment. Insweit it depends also on the maximum width and depth of the equipment. A further subdivision takes place within the two fridge-freezer zones. Today, this is mostly represented by coolers, freezers and storage grilles. Further subdivisions are provided in the doors. What does the climate class of side-by-side refrigerators actually mean? For many household appliances, appropriate climate classes are specified which specify a temperature range in which these appliances can be operated. For a side-by-side refrigerator, for example, we read the designation SN-T on the nameplate or in the operating instructions. The climate class SN stands for subnormal and indicates an ambient temperature between 10 and 32 degrees Celsius. This is comparable to placing our side-by-side refrigerator in an unheated cellar. The climate class N stands for normal and indicates a temperature between 16 and 32 degrees Celsius. This is the conventional living room temperature. Our side-by-side refrigerator can easily be set up in the kitchen. The climate class ST stands for suptropical and indicates an ambient temperature between 16 and 38 degrees Celsius. These refrigerators must therefore be more efficient in order to maintain the desired temperatures even in warm climates. The climate class T stands for tropical and indicates a temperature between 16 and 43 degrees Celsius. So these refrigerators have to withstand even the hottest tropics. In our example, our side-by-side refrigerator is labelled SN-T climate class. Therefore, this device can be used without restriction in any climate worldwide. Why can an ice crusher be useful? a separate water connection must also be available for this purpose. Within a very short time we can remove our ice cubes or pushed ice from the spout. This is really useful for long drinks, cocktails and other chilled drinks. 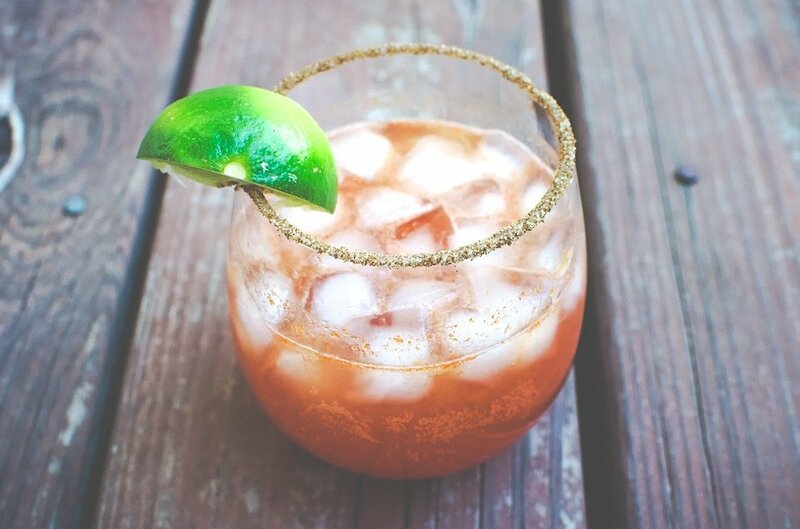 Especially in the warm season, a little ice can refine any drink. An Ice-Crusher offers a sufficient amount of crushed ice, so that we can also fill our champagne cooler for bottle cooling. On average, these devices create between 2 and 3 kg of ice cubes in one go. How expensive can a side-by-side refrigerator be? If you want to buy a modern side-by-side refrigerator, there are understandably no upper price limits. Some of these huge fridge-freezer combinations are already available for less than 1,000 euros. Some of these cheaper side-by-side refrigerators only correspond to a low efficiency class of A+. In view of the increased power consumption, you should invest a little more. Current models with a wide range of functions and a good efficiency class average between 1,200 and 1,500 euros. Here you will also find models equipped with an integrated ice cube maker. If you have chosen one of our side-by-side refrigerator comparison winners, then we would also like to recommend you one or the other accessory. As we have already explained, side-by-side refrigerators with ice crushers require a separate water connection. Some may try to use the water from the common connection of the dishwasher via a Y switch. Although the quality of tap water in Germany is among the best in the world, additional filtration cannot harm . For this reason, there are so-called external refrigerator water filters, which can easily be used as a replacement for an existing filter cartridge. These water filters are offered with the matching side-by-side refrigerators with ¼ inch connection. Some filters, for example, are equipped with a special coconut activated carbon granulate which filters out up to 98% of all rust, chlorine and other water contaminants. To counteract possible contamination, these filters should be changed every six months. Altogether these water filters provide a better taste and a better quality of the ice produced. If you want to read the exact temperature in each refrigerator and freezer zone, you should get one or more_fridge_thermometers_. These thermometers are available in many different versions. In addition to the elongated standard models, we also find circular pointer elements here. But digital thermometers are also very popular. Depending on the version, we can also use a digital thermometer to determine certain upper or lower temperature limits and thus carry out optimum food monitoring. A separate water connection must be provided especially for a side-by-side refrigerator with ice cube maker. In most cases, a suitable supply hose is included in the delivery . Depending on the kitchen equipment, however, such an inlet may also be too short. On the other hand, damage to the hose may occur over time. For this reason the different replacement hoses are offered in the trade . As standard, 10 m refrigerator hoses with ¼ inch diameter are usually offered. The costs for this are around 10 euros. High-quality side-by-side refrigerators should always be illuminated. At least the cooling compartment is illuminated several times, so that we can also get a good overview of the delicacies in the evening. Refrigerators require special light sources that can be used reliably even at low temperatures. As a rule, these are 15 Watt light bulbs with E14 base. In the meantime, modern LED incandescent lamps with this lampholder are also available. We advise you to always keep one or two of these spare bulbs in stock. While the traditional 15 watt light bulb is available for just under one euro, the LED version costs an average of 5 euros. If you have chosen one of our side-by-side refrigerator comparison test winners, it may be of interest to also list possible alternatives. Many may shy away from installing a massive side-by-side refrigerator in his kitchen. The 60 cm wide floor-standing appliances with a height of up to approx. 180 cm are among the refrigerator-freezer combinations most frequently represented in Germany. These models are also equipped with a separate refrigerator and freezer. In total, however, these fridge-freezer combinations only achieve a maximum capacity of around 300 litres. They are considerably smaller than a side-by-side refrigerator. The first models still had the freezer compartment at the top. However, since the cooling area is required much more frequently and handling is also more back-friendly, the freezing area was moved downwards. The modern cooling/freezing combinations are characterised by good energy efficiency . They correspond to the standard width for kitchen appliances of 60 cm. Unfortunately, we usually have to do without an ice cube maker or even an integrated bar compartment with these refrigerators. Nevertheless, these refrigerators represent a good alternative, which can convince in particular with favorable prices. Many of these combinations can also be easily integrated into a fitted kitchen. The French refrigerator is also closely related to the American side-by-side refrigerator. Such a fridge-freezer combination has almost the same dimensions as a normal side-by-side refrigerator. The difference between an American refrigerator and a French model lies in the fact that the upper cooling area of the latter is closed by two hinged doors. The freezing area is realized in the lower part of the refrigerator by one or more freezer drawers. Since the lower freezing drawers of a French refrigerator are very wide, it is much easier to freeze larger items there. On the other side there is a huge cooling area behind the two upper wing doors. Since this is conveniently arranged at the top, we can remove all ingredients requiring refrigeration for food preparation from it in a way that is particularly gentle on the back. French refrigerators still lead a niche existence in this country. However, they are a genuine and extremely interesting alternative to a side-by-side refrigerator. If you have a parking space, you can of course set up two separate units for cooling and freezing as an alternative. There are still individual devices with a high efficiency class and sufficient storage volume. The best-known examples include table-top appliances or compact built-in refrigerators. These are often found in fitted kitchens. They are traditional refrigerators with a large cooling area and a relatively small ice compartment. 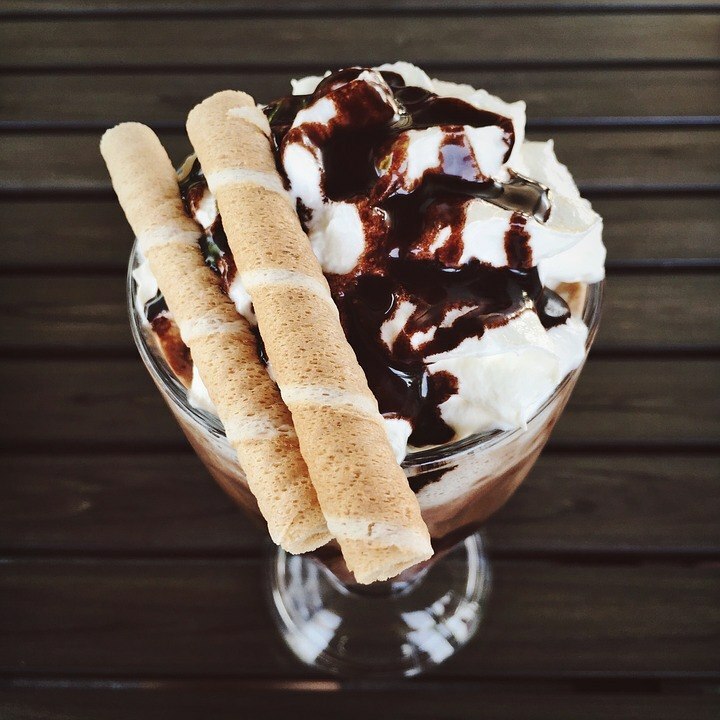 Understandably, these devices are hardly suitable for freezing larger quantities of frozen goods, but for ice cream or ice cubes the storage volume is quite sufficient. There are also freezers to match these household appliances. These usually have two to three freezer compartments. These small freezers are ideal as a supplement and offer sufficient storage space for the small to medium-sized family. However, they cannot replace a side-by-side refrigerator. Even large refrigerators without freezing facilities are very popular in kitchens. The furniture industry manufactures special kitchen cabinets for this purpose. With an attractive front, the refrigerators don't stand out at first glance in such a kitchen. For larger quantities of frozen goods, we can also place a freezer or a separate freezer in the cellar. With the following sources and links we have provided further useful information for you. Of course, the list does not claim to be complete. However, this information should help you to find your desired side-by-side refrigerator even easier.